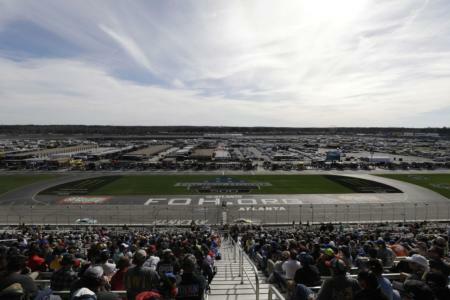 Atlanta Motor Speedway is making the NASCAR experience more affordable for its 60th anniversary. The Speedway has adjusted pricing for the vast majority of its Sunday grandstand seating options, which means the unrivaled sightlines of fans' favorite seats will now be available at a better price. "Our goal is to make the fun and excitement of NASCAR racing at our historic facility accessible to everyone," said AMS Executive Vice President and General Manager Brandon Hutchison. "With these changes, I'm proud to say we're doing exactly that." The budget-friendly ticket prices are the second improvement to come from Atlanta Motor Speedway's "20 in 20" initiative. All told the Speedway will be announcing 20 individual enhancements to increase fan value and the overall enjoyments of the Speedway's 2020 NASCAR event. The first big step in the "20 in 20" initiative came in the form of Atlanta Motor Speedway's new spring race date of March 15, 2020.